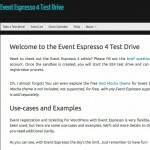 We’ve just finished launching our new Event Espresso 4 test drive website, powered by the Ninja Demo plugin for WordPress. Ninja Demo combined with WordPress Multisite, allows our customers to create their own sandbox website with Event Espresso 4 pre-installed, and is even pre-populated with example events and registration data. 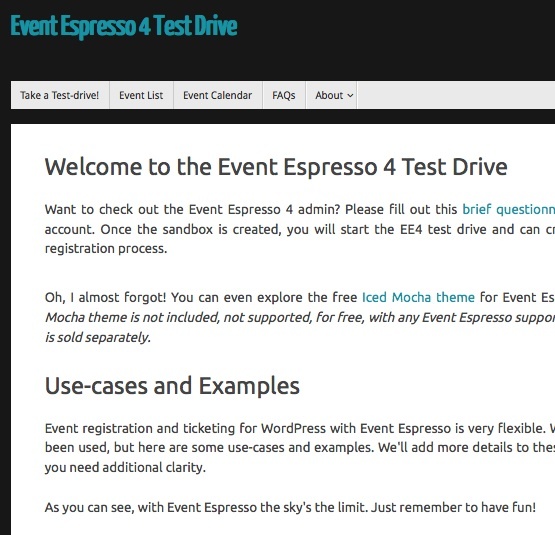 Now taking a test drive of Event Espresso 4 is easier than ever! With Ninja Demo, our potential customers can login to a demo site, where they can modify, delete, upload, and test out various areas of the EE4 software. Our customers can easily demo EE4 without leaving anything permanent behind. You can try out EE4 in a true-to-life environment and Ninja Demo cleans up the sandbox site once its no longer needed. This is perfect for customers looking to learn more about EE4’s features, the Espresso Events Calendar, and our Iced Mocha theme. Already an Event Espresso member? No problem! Existing Event Espresso 3 and 4 members are highly encouraged to take the new test drive site for a spin. This will help you decide if you’re ready to make the move to EE4. You’ll also have the opportunity to test the new Iced Mocha theme we’ve created, just for EE4, which is pre-installed on each sandbox site.